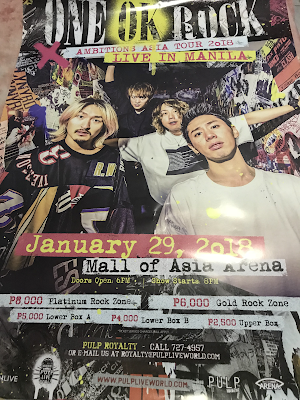 Thanks to that wonderful soul who posted a comment on one of the 2016 One OK Rock concert videos I posted on YouTube, I found out that they were coming back so I got a hold of a ticket as early as possible. Well, this post is certainly late so it's high time I part ways with these for my personal consumption and shared them with the world (chos 😆)! Let me start with the photos (and some story time as usual). As always, I come just right in time before the show starts. While I certainly want to have the best position (if standing can be considered best lol), I don't really want to wait in line too early so as to be the first in line when the gate opens. So this was my spot before it started. VIP loot comes with Pulp magazine copies and the official concert poster below. One of the staff even ushered me towards the entrance. I'm not sure if they did that for everyone else but it sure feels VIP indeed. Taka was all-out throughout the concert. He can belt it out and scream! 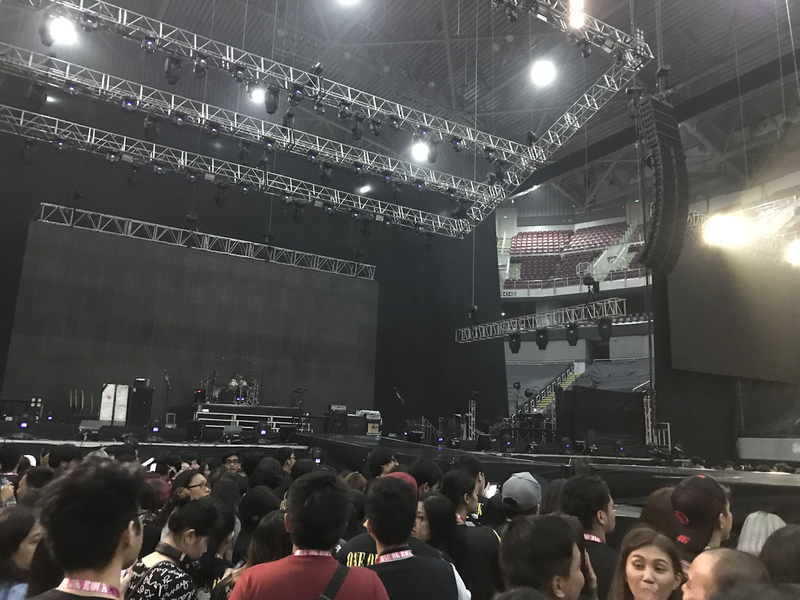 Speaking of B-stage, there was none during the first concert. The lighting was also better this time. They turn it off or dim it during song breaks. While OOR was still all-out back then, the ineffective lighting kinda affected their mood in my opinion. Toru on guitar (below). He was electrifying! Taka (vocals) and Ryota (bass) below. Well, it's not really a trivia for bonafide fans. But I was honestly in awe after I read about it. Ryota is Avril Lavigne's brother-in-law because he is married to Avril's sister, Michelle Lavigne. That's one (above) of the few photos I have where all four of them are present. I have to deal with hands and phones towering overhead. 😒 So honestly, the best seat is whatever comes next to the first row (what they call Patron most of the time) as long as it's the area closest to the stage. It's no wonder why that is the first section to be sold out. It's relatively cheaper and you are seated too. I'm really glad the B-stage was added for this show. I got to see them up close even amidst towering kids in front of me. The group, expressing their gratitude to fans who watched. They are Japanese, after all, so bowing low and then nodding their heads with hands clasped into a prayer sign is quite expected. Click on the album to watch the images in an animated slideshow. 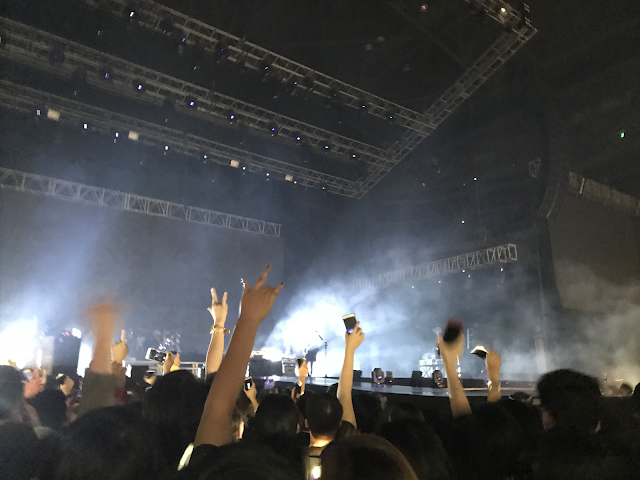 I was too engrossed in the concert (not to mention having nothing to see but hands and phones -_-) so I only have a few short video clips. Update: Video has been deleted. I guess the videos are so clear, they were blocked. A bit of an *** move in my opinion. They can just place ads and earn from the stream instead. This account is not even a YouTube partner; hence, I don't get a cent from the streams. So sit tight, I'll upload it elsewhere & drop a link.